Wesley Kigasung's vision for "healing and reconciliation"
For three days last week, the people of Lae, Morobe province and Papua New Guinea came together as one. They – from different church denominations - put aside their differences, held each other, wept, and sang songs of praise to the Almighty. It was, indeed, a time for healing and reconciliation. It took the life of Evangelical Lutheran Church of PNG leader, Bishop Reverend Dr Wesley Kigasung, to bring us all together. The funeral and burial of Dr Kigasung was something that has never been seen before in this country and will be talked about for many years to time. In my 20 years in journalism, I have covered many, many funerals, and can vouch for that. 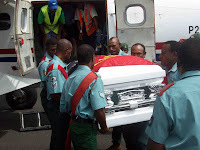 The body arrived at Nadzab airport from Madang last Friday after a week of mourning in which it traveled to Port Moresby, Mount Hagen, Madang, and then Lae before the final journey home to Dr Kigasung’s Aluki village in Bukawa, Morobe province. 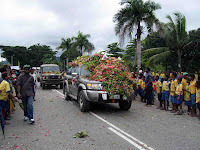 The body of Dr Kigasung was given honours befitting royalty from the moment it arrived at Nadzab just after 11am from Madang. Tears started falling from the moment the Missionary Aviation Fellowship Twin Otter touched down at Nadzab. 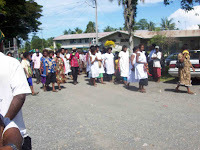 The body was met by Morobe provincial government and church officials, as well as members of the Wampar circuit of nearby Markham Valley villages. The Wampar, once feared warriors before the Miti (Word of God) brought change to their land, welcomed Dr Kigasung with a traditional song of mourning normally reserved for great chiefs and warriors. 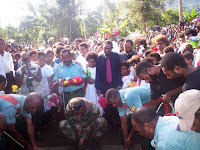 It was then taken by hearse, escorted by a long motorcade of vehicles, to Lae, to ELC-PNG schools and churches in the city, and finally to Ampo, headquarters of ELC-PNG, where it was officially handed over by the military to church officials. The drive from Nadzab to Lae took three-and-a-half hours as thousands of people lined the 45km stretch to pay their final respects. 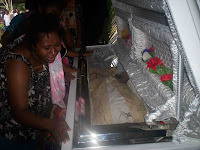 At Ampo, the body was taken to the old St Andrew’s Church at Ampo for a final service with all members of Dr Kigasung’s congregation before being taken to his official residence for a final night of mourning. Last Saturday thousands of mourners – including inmates from Buimo Jail - turned up at the Sir Ignatius Kilage Stadium to bid farewell to a man they had come to love. Representatives from the Lutheran World Federation in Germany, Lutheran Overseas Partner Churches in America, Australia and Germany were also present at the funeral. Leaders from government, church and the private sector also attended the funeral. 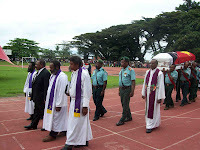 The casket arrived just after 10am where it was received by chief mourner and Assistant Bishop Rev Zau Rapa and Morobe Governor Luther Wenge. 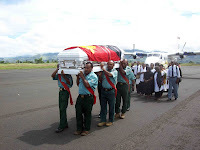 It was then carried by six PNG Defence Force pall-bearers who led the mourning party which consisted of his family, pastors and deacons representing the 17 ELC-PNG districts. After a welcome address by master of ceremony Bami Sorokeinuc and an opening prayer by Anglican pastor Tennyson Boga, the Mass was celebrated by Reverends Kasek Kautil, Kaek and Boga. The eulogy was read by Dr Kigasung’s eldest daughter Joanna who said her father always stressed the need to “think like God and not like man”. After the eulogy, tributes were accorded to Dr Kigasung by Rev Rapa, Mr Wenge, representatives of the Lutheran World Federation and Overseas Partner Churches. The service ended at 2pm to the song “He Leadeth Me” before the viewing of the body and laying of wreaths by thousands of people. Dr Kigasung’s body departed at around 4pm on Saturday by road for his Aluki village. 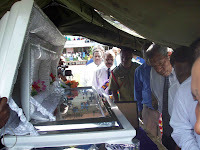 Thousands of people from the Bukawa villages, Lae, Morobe province, Papua New Guinea and overseas flocked to Aluki to see Dr Kigasung buried in a concrete tomb just after 3pm last Sunday. Heavy overnight rain last Saturday night and Sunday gave way to bright sunshine in time for the burial. It ended a week of mourning in which Dr Kigasung’s body traveled to Port Moresby, Mount Hagen, Madang and Lae before the final journey home to Aluki. 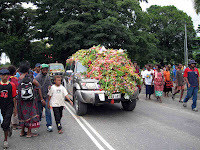 Thousands of people lined the road from Lae to Aluki to bid farewell to Dr Kigasung as his motorcade drove past. In emotional scenes, men, women and children wept, sang, waved banners, flags and threw flowers at the motorcade. In one of the most-moving scenes, at Situm primary school, children sang a touching tribute to Dr Kigasung which brought tears to the eyes of those in the motorcade. 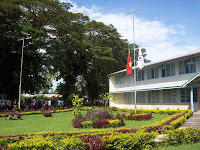 Many commented that the respect accorded to Dr Kigasung between Lae and Aluki, as well as that shown between Nadzab and Lae, and at the Sir Ignatius Kilage Stadium, had never been seen before in this country. 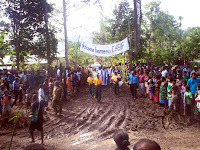 At Aluki, tears again flowed freely for its favorite son as local villagers, those from Lae, and others from Siassi Island – the place where Dr Kigasung was born and the last place he visited – sang traditional songs of mourning for the charismatic and much-loved leader of 1.2 million Lutherans in PNG. As daylight came, I also broke down and wept, for this dear friend and brother of me and my late wife, Hula, who passed away so tragically on Easter Sunday this year. 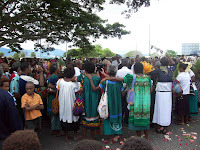 The funeral service was delayed because of the non-arrival of Morobe Governor Luther Wenge as expected. 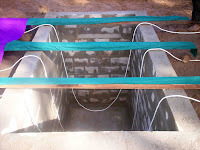 The burial was later delayed again because of the slow drying of cement in the concrete tomb because of the wet conditions. VIPs present included Lae MP Bart Philemon, Tewai/Siassi MP Vincent Michaels, Bulolo MP Sam Basil, former judge Don Sawong and Kambang Holdings chairman Namon Mawason as well as a representative of the American Lutheran Church. ELCPNG Jabem District president Reverend Gedisa Okamaisa said Dr Kigasung was a “humble” servant of God and the people. “He left us at a time when we least expected,” Rev. Okamaisa said. I leave the last words to Dr Kigasung, who told me in a rare interview in 2006: “I believe with a new inspiration and motivation from the members of the church, the future of the church will be more exciting and challenging. “But I believe the future will find a new empowerment as people reactivate their faith and are ready to share that faith and through that sharing, they will be able to put their resources together in building their church. 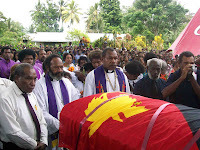 Evangelical Lutheran Church of PNG leader, the late Bishop Doctor Wesley Kigasung, was laid to rest at his Aluki village in Bukawa, Morobe province, after 3pm last Sunday, May 25, 2008. 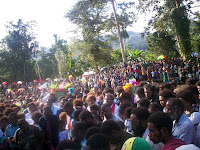 Thousands of people from the Bukawa villages, Lae, Morobe province, Papua New Guinea and overseas flocked to Aluki to see Bishop Kigasung buried in a concrete tomb. It ended a week of mourning in which Dr Kigasung’s body traveled to Port Moresby, Mount Hagen, Madang and Lae before the final journey home to Aluki by road from Lae last Saturday afternoon. Many commented that the respect accorded to Dr Kigasung between Lae and Aluki yesterday, as well as that shown between Nadzab and Lae last Friday, and at the Sir Ignatius Kilage Stadium last Saturday, had never been seen before in this country. 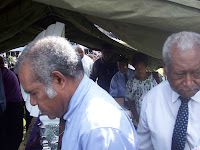 Last Sunday's funeral service was delayed because of the non-arrival of Morobe Governor Luther Wenge as expected. 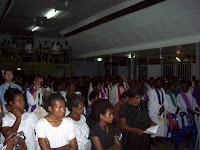 The Evangelical Lutheran Church of Papua New Guinea, one of the largest mainline churches in the country with up to 1.2 million followers, is mourning the sudden death of its charismatic leader – the American university educated Bishop Reverend Dr Wesley Kigasung – who passed away early today (Thursday, May 15, 2008) aged 57. He will be remembered by Lutherans all over the country for his skills as a preacher of the Word of God. Wesley Waekesa Kigasung comes from Aluki village in the Bukawa area of Morobe province. He was born on July 16, 1950, and is married to Susie Manempen Kigasung of Mindere village in the Rai Coast area of Madang Province. The Kigasungs are blessed with two daughters and two grand daughters. The young Wesley Kigasung received primary education in remote Menyamya and later on Siassi Island where he did secondary schooling at Gelem High School (now Siassi High School) from1966 to 1968. 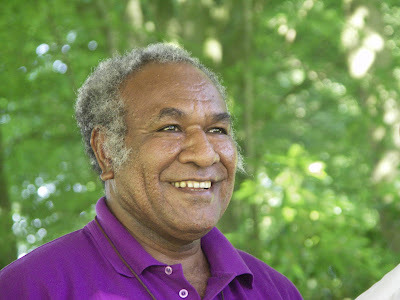 He completed High school at Asaroka Lutheran High School in Goroka, Eastern Highlands in 1969. Kigasung attended Martin Luther Seminary from 1970-1975 and graduated in 1975 with Diploma of Theology and Bachelor of Theology. He received further studies at the University of Papua New Guinea in Port Moresby from 1976 – 1978 and graduated from the University in 1979 with the degree of Master of Arts majoring in history of PNG). From 1979 to 1980 he served as Circuit Pastor in remote Kaintiba, Gulf province. In 1981 Kigasung was called to teach at Martin Luther Seminary in Lae until the end of 1982. In March 1983 he left with his family for Germany for language studies. Towards the end of 1984 he again left for further studies in Chicago, USA, where he graduated in 1986 with the degree of Master of Theology at the Lutheran School of Theology in Chicago. Kigasung continued studies for his doctoral degree and completed all doctoral work in 1989, when he received the degree Doctor of Theology from the Lutheran School of Theology in Chicago. He resumed work as Lecturer at Martin Luther Seminary towards the end of 1989. In 1991 he was appointed Principal of Martin Luther Seminary and served as Principal until 1997. In January 1998 Kigasung was elected Head Bishop of the church at the Kimbe Synod. Kigasung is widely respected as an intellectual and a leading preacher of the word of God in this country. “I believe it is a special gift from God,” he told me in a rare interview in 2006. “From my early years in school I already developed the skill of speaking in front of my peers. “Through the years I have challenged myself to develop my abilities in order to serve well. “I like to read a lot and I have read lots of books on leadership and other books that help to develop my skills in working and communicating with people. Kigasung says being the spiritual leader of all Lutherans is not an easy task but he finds so much joy in serving God. “It is not easy,” he says frankly of his job. “Very challenging and very demanding. “But there is much joy and satisfaction in serving God's people. “I find much joy in meeting people of different cultures and different works of life and back ground and of different nationalities. “You see and experience God's wonders and life in the faces of these different people in the church. “I leave my future in God's hand. “This is my last term as Head Bishop. 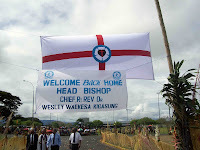 From January 9 to 13, 2006, the ELCPNG held its 25th Synod at remote Wasu in Morobe province, where Dr Kigasung was reelected for a third four-year term. The first Synod was held in 1956 at Simbang, Finschhafen, the site of the first landing of the pioneer German missionary Johannes Flierl in 1886. The first Head Bishop of the newly founded Church, the Evangelical Lutheran Church of New Guinea (ELCONG) was elected in 1956. He was an American missionary, the Reverend Dr John Kuder. The three Head Bishops preceding Dr Kigasung were Bishop Dr. John Kuder (1956 – 1972); Bishop Sir Zurewe Zurenuoc (1973 – 1981) and Bishop Sir Getake Gam (1982 – 1997). Dr Kigasung was reelected at a time where there is splintering within the church through the Lutheran renewal movement; when there are criticisms from within the Church itself that it has become sluggish and has been sidetracked from fulfilling its greatest mission of spreading the word of God; that it has become so vocal on business matters without paying any attention to evangelism, ministerial training, health, education and the welfare of its pastors and evangelists; and there has been talk about the creation of a Lutheran university in Lae. “The major plans for the future of the Church is to revisit the mission of the church; to revitalise the church to become more responsible and accountable in financial matters; improve leadership responsibility; improve pastoral responsibilities as well as addressing the concerns of the pastors and other church workers. “I encourage all Lutherans to share their faith in the many gifts and talents that they possess to help build the church. “I want to introduce to the church the theme for the new period of this church for the next 50 years. “I want to challenge all genuine and committed Lutherans with the theme: ‘Sharing the Faith, Building the Church’. A new 100% nationally-owned company has been formed to assist landowners with their mineral and petroleum assets. The company, Samuel Were Petroleum, a subsidiary of Bright Star Morning Corporation, is run by Samuel Were, a petroleum geoscientist from the Western province who is a graduate of the University of Papua New Guinea. The company was dedicated by United Church Reverend Siosi Momoru at a ceremony at the NCD Botanical Gardens presided over by Western Province Governor, Dr Bob Danaya, who commended Mr Were for the grassroots approach he is taking to helping resource owners. SWP is already involved in 14 mining and petroleum projects in Western, Central, NCD, Morobe, and East and West Sepik provinces. Mr Were said a second batch of 14 projects in 14 provinces was underway while the third and final batch would include 10 projects in 20 provinces. He said petroleum and mineral resources already discovered included oil shale, pegmatite, tin, iron, aluminium, beryl, lamprolite (diamond host rocks), manganese, chromites and zinc. “This means new industries to come to the scene,” Mr Were said. Governor Danaya, who announced that the Fly River provincial government had secured the services of SWP as its mining and petroleum consultant, said the people of PNG should no longer be spectators on their own land. “Since the 1900’s, Papua New Guinea has always been the envy of the world because of her huge deposits of mineral and petroleum resources all over the country,” he said. “Our people have continued to be mere bystanders and/or spectators, only performing the roles of labourers or guiders without realising any tangible benefits as resource owners. “It is therefore in the interest of our people, particularly the resource owners that they are seen to be proactively involved and/or are supported to participate fully in the earth resource projects from exploration to development stages. Hi orchid gardeners of PNG. I received this email from Jeremy Seah in Singapore, email pangansari@singnet.com.sg, wanting to buy PNG orchids. Like to know if orchids from PNG are now available for export? You have any link to exporter which I can contact via email? The next event that the National Cultural Commission is beginning to work on it is the Gulf Mask Festival which will be held on June 12-13, 2008, at Toare Village, Kerema, Gulf Province. The event was initiated and incepted by National Cultural Commission three years ago. The main objective behind hosting the above event is to revive the Eharo mask which was believe to be extinct. However, with the above event, the NCC is now reviving this important Mask Culture of the Eastern Gulf People. For more information, please contact David Taim, Senior Festival Officer, National Cultural Commission, on email culturetok@ncc.org.pg. We buried Jack at home in Butibam village, Lae, on Tuesday, November 2, 2004, under one of those typically-beautiful November afternoons. He had just turned 21 in September, had a pretty Manus girlfriend and a bouncy seven-month son, and was eagerly looking forward to graduating from the University of Goroka next year and becoming a music teacher. All these hopes and dreams, however, were cruelly snuffed out like a candle in the wind when Jack’s heart gave way at the Port Moresby General Hospital on the night on Monday, October 25. Jack Remus Nawatz, elder son of my sister Alison and her husband Goromp Nawatz, was born with a heart defect in Lae on September 9, 1983. It was something that doctors hoped would go away over time; however, this was not to be. Alison and Goromp were then studying at the University of Technology in Lae and I remember the unparalleled joy that Jack brought into our lives. Since the two were busy at school, Jack’s grandparents – my mum and dad – looked after Jack as one of their own. I remember that time in November 1983 when Jack was to be baptized at the Ampo Lutheran Church in Lae. My elder brother David, who had just graduated a day earlier from Aiyura National High School, sacrificed graduation parties to be with us for the day. We were all at Ampo Church on Tuesday last week – exactly 21 years later - for Jack’s funeral service. It was David who read the eulogy – a far cry from 1983. There is a picture somewhere in one of my old albums, of David and me carrying Jack the day of his baptism in 1983. We carried his coffin last week. Despite his short life on this earth, Jack brought so much joy and happiness into our lives. He was never a strong child, because of his heart defect, and wasn’t actively involved in sports like many of his peers. He would have made a very good basketball player – all six feet, four inches of him. Jack, however, found his forte: music. A very talented musician (Jack could play a variety of musical instruments) since his primary and high school days in Lae, Jack decided that this is what he must study. In 2002, he went to the UOG, to take up his first year of studies. I was then living and working in Goroka, with my wife and two sons, and Jack became very much a part of our young family. 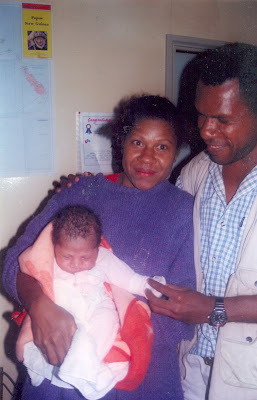 Unfortunately, we had to leave Goroka in mid 2002 because my three-year work contract was up, and we left Jack behind. He remained, and together with some of his best mates, formed a band that often performed at the University of Goroka. I never realized how good a musician he was until last year, when I was up there for a weekend, I got to watch him play at a concert. There couldn’t have been a prouder uncle! This year, because his Manus girlfriend Evelyn was pregnant with their son Steven, the young couple was ejected from permanent accommodation by the seemingly-draconian University of Goroka administration. They rented a backyard shed, down the hill from the university, and continued to look after their newborn baby while going to school. Jack, with his weak heart, continued to trudge up the steep hill leading to the UOG – something that often made him sick. Earlier this year, while in Goroka for the PNG Coffee Festival & Trade Fair, I fell very sick and was admitted to Goroka Base Hospital. It was kind-hearted Jack and his UOG mates who looked after me. I promised them drinks at the end of the year – this will never be now. In September, Jack turned 21. 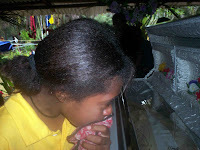 In October, he came to Port Moresby after final exams, and started complaining of chest pains and shortage of breath. He was admitted to hospital, with a smile on his face for all family and friends who visited. He was discharged, however, fell ill again was readmitted to hospital where the heart problem which had plagued him all his life finally claimed him. I took a picture of Jack and his son Steven in Goroka in May this year. Papua New Guinea is famous all over the world for its fantastic dive regions, its colourful reefs, its varied marine life and coral. No other country has as many different types of fish and coral on show as PNG does. Many people travel thousands of kilometres to visit our country and dive and snorkel our beautiful reefs. Often, the locals are the last to realise what is right on their doorstep, so from now on, The National will introduce to you some of these dive destinations, dive resorts/shops and dive liveaboard boats, keep you up to date with the latest news and specials and hopefully entice you to visit some of these beautiful spots! I would also like to call on all the resident divers, snorkellers and travellers, no matter where you live and where you dive/snorkel/visit: If you have great pictures to show off, awesome stories to share, please e-mail me on info@lissenung.com and I will include your contributions! Tufi welcomes the latest addition to its fleet (pictured above), a 28 foot Noosa Cat with 2 x 250hp Suzuki 4-stroke outboard engines and fully equipped with VHF radio, Epirb, GPS chart plotter. Side entry dive access, placements for 10 divers plus crew, full toilet, shower and camera wash facilities make this boat very comfortable! Cruise speed is a whopping 24 knots, making Tufi’s outer reefs accessible in less than 30 minutes! You got to be on it to believe it! Kabaira Dive Rabaul was a buzz in March! Firstly, the house was full with scientists who were in town attending a Cocoa Workshop, then Rabaul hosted the 2008 National Game Fishing Titles. There were over 220 anglers from around the country, as well international, who attended the 10 day event. Since there are only 2 fishing days permitted per angler, Stephen and his crew were bombarded with bookings for diving, camping, sightseeing, bushwalking and even more fishing. Stephen took a group of 3 keen anglers down to the Talele Islands for a 2 night camping trip while Richard was in hot pursuit of critters for our underwater photographers and Lloyd looked after the Land Tours of Volcano Town and WWII Sites. Chris, the dive operations manager at Tawali Resort in Milne Bay reported sightings of Rhinophias (Lacy Sea Scorpionfish), Epaulette Sharks, a pod of Orca Whales surfacing very close to the dive boat, plenty of White Tip Reef Sharks, and a large school of Bumphead Parrotfish. Tawali Resort is situated on a limestone bluff in Hoia Bay, Milne Bay and looks out across the beautiful Milne Bay to Normanby Island in the distance. The resort is an excellent place to get away from it all for a short or long stay even if you are not currently a diver. The resort offers relaxation in a hammock over the beach and lapping waters, kayaking, snorkeling, guided mountain hiking, tours to the skull caves and local waterfall, or even a coastal walk visiting some of the local villages. The latest news for Lissenung Island Resort in Kavieng is that the resort now has 6 double/twin/single rooms with private bathrooms. Only one room still uses the “public” bathrooms. There have been rumours that the resort is about to close up, but nothing could be further from the truth! One bungalow has just been completely re-build and we have put too much sweat, tears and money into it to give it all up. Plus, we enjoy what we do, why should we give it up? On the diving front, we had some awesome sightings! Planet Channel and Eagle Ray Passage delivered 7 Spotted Eagle Rays last week, at Bermuda Drop Erik Ranstead from from Germany found a Halimeda Ghostpipefish (pictured above) and during surface intervals, the divers were treated to a pot of Pilot Whales and jumping Sailfish. While the Sailfish always remained in the distance, the pot of whales actually enjoyed some gentle interaction with the guests who had hopped in for a snorkel. What a buzz!!! Well, that’s it for now! I hope you enjoyed this little newsletter and it will get you traveling some more. If you are not a certified diver yet, you may want to visit John Miller at The Dive Centre in Port Moresby, located pool-side at the Airways Hotel. Many a diver who has spent time in PNG has John’s name on his or her card as the certifying instructor. John also has a well-stocked dive shop, so if you in want of some dive gear, talk to him! Till next month, and don’t forget to e-mail me your stories! Please shrink any pictures that you send, as on the island, we are only one step ahead of smoke signals. If you think your internet connection in the big cities is slow, you should come to the island one day! It may come as some surprise to realise that Orca, normally seen in documentaries featuring ice floes, penguins and cold water can be found in the Bismarck and Solomon Seas. Guests of Walindi Plantation Resort in Kimbe Bay had the pleasure of seeing these fantastic animals close-up! Resident within the huge area of the Bismarck and Solomon Seas, the Orca is an unusual sight in our beautiful tropical waters as they prefer to hunt far out to sea. Occasionally though, there is the once in a lifetime opportunity to see these utterly spell binding creatures closer to land. Kimbe Bay, home to Walindi Plantation Resort, is a favoured haunt of the Orca, with regular sightings throughout the year. Staff and guests of Walindi enjoyed their first sighting in June 2006, when a small pod of six Orcas, intrigued by the thrum of the engines, came to investigate the dive boat and its occupants. Specially designed boom nets which extend from the boat allowed guests the opportunity to examine the Orcas from the water, hanging onto the boom nets, snorkels firmly in place. The boat cruises slowly through the water, with the Orca surfing in the bow wake scant meters below the entranced guests. The Orcas spent about an hour playing in the waters around the boat, before, as if obeying an unheard signal, they turned to resume hunting, disappearing as quickly as they had appeared. With a maximum length of 10m and weight of 9t, the Orca, whose proper name is Killer Whale or Orcinus orca, is the largest representative of the Delphinoidae. The characteristic black-and-white pattern and a vertical dorsal fin that can reach up to 1.8m in height on a male mammal make it easy to identify this species. Other typical features include an elliptical white patch over each eye and a white patch on the underside. Orcas are very playful and inquisitive. They often breach, spy-hop and perform other acrobatics. The guys and girls on Mike Ball’s Paradise Sport got to enjoy the visit of another large creature. A whale shark came to say G’day at Tingwon Island, west of New Hanover in New Ireland Province. When I talked to Skipper Pete, he told me that Peters Patch “went off”! It was like all the fish in the area were having a meeting right there, even a marlin came in to check things out. The 17 guests on board were also treated to huge schools of Barracuda that were following them around on a number of dive sites. We, too, had a slightly unusual sighting with a 3.5m Hammerhead scaring the wetsuits off some divers, enthralling others. Guests from Lissenung Island Resort were diving Nusa Blowholes, off Nusa Island just opposite Kavieng, when the shark came along, having a good look at the divers, and then deciding that they probably would not be very tasty in their rubber suits. Our Italian friend Guiseppe got this great shot with his small digital camera! Last but not least, we saw some great things on land, too. 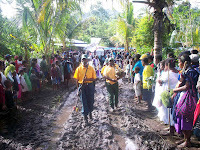 The local Malagan Show was held in Kavieng for the first time in many years on July 17 and 18, 2006, shortly after the Rabaul Mask Festival. Sing-sing groups from New Britain, the Highlands, of course New Ireland Province and other regions descended on Kavieng to perform during the show. The costumes were fantastic, very colourful and with lots of eye for detail. One of the local groups performed a dance that celebrates the famous Shark Calling tradition. All the tools needed were included in the dance and they even had a carved shark “swimming” around the podium. Locals and tourists alike enjoyed the festivities and we almost had to drag our guests back to the resort at the end of the day. We sure hope that many more Malagan Shows in Kavieng are to come! Happy and safe diving again this weekend! · Ange Hellberg is the Marketing Manager for Lissenung Island Resort in Kavieng, New Ireland Province. You can contact her on info@lissenung.com and have a look at their website on http://www.lissenung.com/ . WESTERN Province has a lot to offer in terms of tourism and it would no doubt be a potential tourist destination because of its unique cultures which it can expose to the rest of the world. The Middle Fly District is made up of three Local level Governments comprising of Suki, Lake Murray and Balimo. There are more than 27 villages along the river leading out from Balimo towards the Suki and Lake Murray area and this is where you get to find the real fun -oving character of the local people. The view along the Aramure River going towards Awaba is about five hours by dinghy and is spectacularly beautiful for those who intend to go bird watching or going fishing. The bird life will never stop to amaze tourists as you travel along this most-captivating river and find that there is more bird life than one could imagine. Night hunting is a norm for the locals but can be a good experience for those who love excitement and adventure. Balimo is renowned for its beauty in the abundance of wildlife and rich culture and the staging of the sixth Gogodala Canoe festival last month was no exception to that. The Governor for Western Province, Dr Bob Danaya, said “we must look at development from a different perspective because it will bring development and other major benefits”. “The Middle Fly is far expanding and there is great potential in promoting tourism here in the province”, he said. 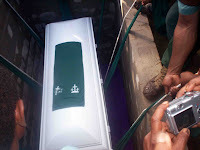 The town is currently under construction to upgrade most of the facilities for the locals and as well as those intending to go for holiday or sightseeing. Tourists or visitors can check into the Biyama family house where 10 rooms are available for rent if going in a group or as an individual. The town area is very peaceful and there is a health centre, a few shops and a main market housed in the centre of the town. Transportation on dinghy along the river can be arranged upon consultation with the district Administration and the town Committee, or otherwise, a walk around the town can take only half a day. The Gogodala Canoe Festival is an enriching way to truly appreciate what these people have to offer in terms of natural wildlife and the culture. This festival is held annually in April and those who are interested can collect more detailed information from the National Cultural Commission website. Miss Jacklyn Saleu (pictured left) was crowned Miss Coffee Festival, 2008 at the Coffee Ball, which was held at the Pacific Gardens Hotel in Goroka last Saturday Night, May 10. Miss Saleu, who was sponsored by Gold Finance, was among six contestants who ran for the title. The night saw Miss Miriam Moi, win the Miss Coffee Festival first runner-up, Miss Friendship and Miss People’s Choice whilst Miss Saleu grabbed Ms Traditional and Miss Coffee Festival 2008. Current Miss PNG and out going Miss Coffee Festival 2006 Ms Genevieve Roberts announced on the crowning night that the newly-crowned Miss Coffee Festival 2008 would enter the Miss PNG contest this year. Plans and funds for the Madang festival have been underway with more assistance from the provincial government for the revival of the big event in June. Madang Governor and former Chief Justice Sir Arnold Amet said he had allocated K200, 000 to the committees to promote the event this year. Sir Arnold added that the event would be one of the many ways of promoting Madang’s culture both here and abroad. He also encouraged business houses and the committees to conduct fundraising so that the event could be self- sustaining without the provincial government having to budget for the festival each year. Sir Arnold said that the purpose of hosting the festival was to unite people from the local and international communities in the province. Madang Provincial Administrator Joseph Dorpar said the aims for resurrecting the event were for the people to commemorate their cultures as their national identity and appreciate themselves as citizens of the province. He said responsible citizens would help promote culture and tourism in and around Madang. “Tourism is a big market and Madang is the ideal spot for tourist attractions”, Mr Dorpar said. He said there would be diverse activities like cultural singsings, live concerts and sporting events. Mr Dorpar added that all the activities throughout the festival would contribute towards the economic growth of Madang. Sir Arnold is hoping to make the festival a premier cultural and tourism promotional event with Madang’s own variety so that it can be celebrated annually. The Taiwanese government and media have have implicated Timothy Bonga and Dr Florian Gubon in the the US 30 million deal from money that was supposed to come to PNG. I received this email from Taiwan TV yesterday trying to do an interview with me on background about Timothy Bonga. I haven't got your response yet. However, we would really like to do a phone interview with you. Will it be possible for you to accept be interviewed by us? My TV station is a 24-hour cable news channel. You can clarify or state your opinions on our news to describe what you know about Mr. Bonga. Wish to hear from you soon. > I was searching on the net hoping to find out who MR.
> TIMOTHY BONGA is and I found your blog. > people involve in our foreign affair schandal. > kind of the person Mr.
> Hope to receive your mail soon. > Chiou I-jen were leaving their posts. > ties with Papua New Guinea. > it switched its recognition from rival China. > the Taiwanese diplomatic column. > his role in the fiasco. > my post," he said. > but denied any criminal wrongdoing. > among potential foreign allies. > as a way of asserting its claims to sovereignty. > Tuesday, saying it had brought disrepute to Taiwan. > image of the country and the government," Chen said. > "I neither directed nor participated," he said. I’ve just been supervising the design of our Mothers’ Day supplement, which, for me and my children, will be different this year without their Mum, my wife. Grief can become an overwhelming emotion. These inspirational quotes on death and grief could offer a more enlightening, comprehensive perspective on one of life's most serious topics. More words of inspiration and daily inspiration can be found in "Life and Other Options." For widows,widowers or anyone suffering through mourning or bereavement -- the death and loss of a close loved one -- the overwhelming sorrow and grief is unbearable. These inspirational quotes on death and grief were specially chosen for widows or widowers to offer a more enlightening, comprehensive perspective on one of life's most serious and emotional topics. Death and dying, loss and sorrow, mourning widow or widower and hopeful survivor -- all are aspects of life's larger plan. Papua New Guinea has been an eligible country for Endeavour Awards since the inception of the awards. The Endeavour Awards are managed by the Australian Department of Education, Employment and Workplace Relations (DEEWR). They were established as part of the 2003 International Education package ‘Engaging the World Through Education’. Picture above: Robert Bino with his Masters from the Australian National University in 2006. This is an academically-elite program, bringing high achieving students, researchers and professionals from the region to Australia each year to undertake short or long term study, research and professional development in a broad range of disciplines. Papua New Guinean applicants are selected using the same merit-based application process as all other applicants from all countries. In 2007, 57 Papua New Guineans applied for an Endeavour Award, nine of whom were successful in receiving an Endeavour Award. This included four Vocational Education and Training Awards and three Postgraduate Awards; six females and three males were successful Endeavour Award recipients. 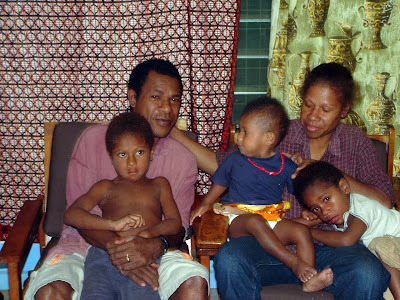 In 2008, 45 Papua New Guineans applied for an Endeavour award, seven of whom were successful in receiving an Endeavour Award. This included five Vocational Education and Training Awards, one Executive Award and one Postgraduate Award; five males and two females were successful Endeavour Award recipients. Award Holder fields of research include language and communication studies, information technology, electronic systems, Pacific and Asian studies, aerospace studies, English language teaching and logistics. In April 2008, a series of Award holder functions will take place around the capital cities of Australia to celebrate the Endeavour Awards. The 2009 application round of Endeavour Awards opens on April 9, 2008, and closes on July 31, 2008. 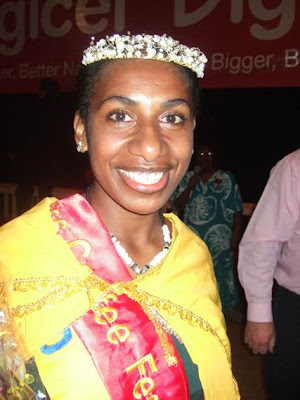 Dulcie Dennis completed Grade 12 at the Port Moresby Grammar School in 2004 and from 2005– 2006, studied Certificate 2 in Tourism and Hospitality at the IEA College of TAFE at the Ela Beach Campus, Port Moresby. Last year, Dulcie won a scholarship under the Endeavour Award for a Diploma in Tourism & Travel Management at the South bank Institute of Technology in Brisbane, Australia. “It is a great honour and privilege to be a recipient for such an award, which opens up a lot more opportunities for me in the future,” she says. “The course that I am currently undertaking will certainly prepare me well for a career in Tourism and Management in PNG. “This is an industry that has a lot to offer toward economic growth and nation building and I am eager to offer my service in this area. “I have enjoyed every moment of my time and studies under this award and want to encourage future recipients to strive to be the best, commit time to studies, remain focused and value this wonderful and prestigious opportunity. Eunice Dus is a Masters in Applied Science student at the James Cook University. “I agree that a lot of Papua New Guineans do not know about this Endeavour Award,” she reveals. “I did not know until July, 2006, when the Australian Universities came up to Goroka, as well as Lae and Port Moresby, to showcase their universities. “While attached with the PNG Wildlife Conservation Society in Goroka, as an Intern Ecologist, I applied for the Endeavour Award. “Knowing that it was a prestigious award, I underestimated myself and was a little reluctant. However, I went ahead and applied. Honestly, I was shocked when I won the award. “I would like to encourage other Papua New Guineans to apply for this award. Konio Kwalimu Pala, who teaches geography and ESL with the Port Moresby International School, remarks: “Participating in the Endeavour Executive Awards Program was a long and rigorous process. “With its comprehensive criteria, stringent time frames, hours of negotiation with host institutions to secure a place, and evidence required to prove one worthy of being a recipient made the challenge for applying even more difficult. “Being a recipient of this prestigious award is a great privilege as it enabled me to undertake Professional Development outside of PNG. “Whilst attending University of Queensland, I participated in two courses. “The first, the CELTA (Certificate in English Language Teaching to Adults), a Cambridge University course offered by ICTE-UQ, provided both theory and practical components. “In addition I undertook work experience at the Institute of Continuing & TESOL Education – UQ, enabling me to further my teaching skills. “The second programme is the (IDLTM) International Diploma in Language Teaching Management. 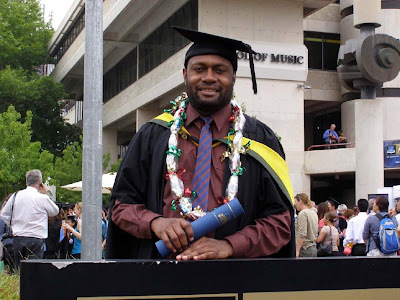 Noel Wangunu is a Papua New Guinea marine biologist who has always wanted to do his best for the country and for local coastal communities in assisting communities manage their marine resources, and is now doing his Masters in Applied Science at James Cook University. “Working with Conservation International (CI) in the Milne Bay Marine Conservation Project was a good start for my career,” he says. “The decision of taking up studies or furthering my education has always been with me ever since I graduated from the University of Papua New Guinea. “This opportunity of study here now provides me with a better opportunity to work and learn a lot from institutions in Australia, especially Queensland Turtle Research, in working on issues in managing turtle and dugong which are listed as Endangered species under CITES. Research School of Pacific and Asian Studies, Australian National University. “Not many Papua New Guineans have benefited from the Endeavour Scholarship Awards,” he says. 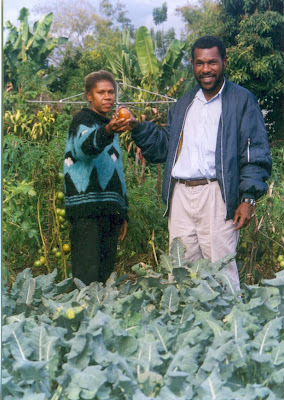 “For instance in 2008, I am the only Papua New Guinean awardee in the Postgraduate Award category to do PhD studies. “It is mostly the Asian countries who have been getting the bulk of the scholarships as opposed to Pacific Island countries. “So I would like to encourage more Papua New Guineans to try out this opportunity as well. “You can never know until you've tried. “I thought I should also mention my topic for my PhD research which may interest many PNG citizens because it is currently a hot issue for the PNG and Australian governments. “My thesis will be a cost-benefit analysis of the conservation and economic benefits of the Kokoda Track. “I will also look at how this issue is affecting the politics of the bilateral relationship between PNG and Australia.